Last Monday my husband and I started taking ballroom dancing lessons. And after two weeks of being whirled about in my plastic tiara from Party City, I’m hooked. During our first lesson, I immediately thought of Elizabeth Bennet and Mr. Darcy in those wonderful ballroom scenes we read about in Pride and Prejudice. His bowing, her curtsying, their manners, their grace and of course their sexual tension. I feel very much like Lizzy while waltzing around the room, however, the Waltz (which is what we’re learning) is utterly different than English country dancing (the sort of dancing that took place in Pride and Prejudice). English country dancing has a series of particular movements, called figures. The dances — as you see in the films or read about in the books — are not one-on-one. Heaven forbid! That would have been considered outright “dirty dancing.” It may have been brewing somewhere…but not in P&P. Guests instead danced in a polite set. A set is a group of couples; most commonly two, three or even four couples at a time. Imagine the folksy square dance. Men and women would not embrace or face each other but move longways and progressively. Basically, couples would form two long lines (picture Darcy and Elizabeth); each couple would then “travel” to the end of the line, meeting a new couple and repeating a series of movements. 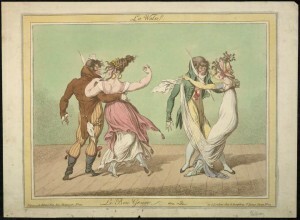 I read Austen’s Persuasion again this month and noticed the lack of dance and ballroom scenes. Anne Elliot attends a concert, however, hoping to get some quality time during intermission with Captain Wentworth, but that’s about all in terms of “partying.” Oh, and Anne also accompanies a small group at the piano-forte. Other than that, no balls, no dancing. I’m no dance expert, but from what I understand, the evolution of ballroom dancing moved from “line-dancing” to “Cotillions” to “Waltzes” during Austen’s life. In terms of music (and the Waltz), the sheet music from Jane Austen’s home reveals her appreciation for contemporary music at the time; with sheet music of Handel, Haydn, and Bach. All having written some very lovely music in the Waltz genre. Music was in a transitional period. Dance was in a transitional period. And Persuasion is written in that transitional voice. The voice between youth and spinsterhood; between cotillion and waltz. It’s the story about second chances (I love second chances) and transitioning. I love Anne Elliot like a friend who is trying to find her way as she transitions through mistakes and regrets and when I read Captain Wentworth’s letter, with his “you pierce my soul” words, I celebrate Anne’s second chance finally coming to fruition. Saying good-bye to the structure of line-dancing and joining Captain Wentworth in a Waltz.